Hugo (Asa Butterfield) is an orphan who lives behind the walls of a train station in 1930s Paris. His job, (left to him by his Uncle - who has since disappeared) is to make sure that all of the station’s clocks run on time. Hugo misses his father dreadfully. He deals with his grief by fixing an automaton that he and his father had started to repair. To do this, Hugo needs a range of new parts. He gets them by stealing from a toy repair store in the station. However, he is soon caught by the store’s owner - the mysterious Papa George (Ben Kingsley). Papa George is suspicious of Hugo and makes him empty his pockets - he confiscates Hugo’s stash of stolen parts and also his father’s notebook, which contain his notes on how to fix the automaton. Desperate, Hugo befriends Isabella (Chloe Grace Morentz), a young girl who lives with George. They work together to get Hugo’s notebook back and also unlock the secrets of George’s past. Join The 500 Days Of Film Club Today! Hugo is a fantastic film that all the family can enjoy - I know mine did. It starts with this most amazing shot that swoops into the train station and from that point on you know that you are watching something special. Hugo is all about the mechanics of film and, as a result, worked really well in 3D. 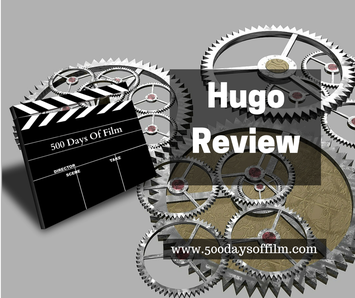 However, for my 500 Days Of Film challenge, I watched Hugo in 2D at home. I had heard that this film was not as good without the 3D effects but I certainly did not find that to be the case. Yes, 3D works in Hugo in a way it doesn’t (for me at least) in other films. But I still enjoyed all the mechanics of the film and all the long sweeping shots just as much in 2D. Before long, you realise that Hugo is a love letter to cinema. The film tells such a wonderful story about the magicians and inventors that first started to experiment with moving pictures. Hugo is gorgeous to look at and features some powerful central performances. It swept me up and I was entranced until the very end. The film has some really emotional moments - made all the more poignant for me by how attached I had become to Hugo and George. I also loved Hugo for how it made me feel about cinema. Martin Scorsese creates a fantastic sense of the importance of movies and how a love of film is a worthy pursuit. Films are not just entertaining time fillers, they are dreams made real. Despite receiving high praise and garnering 11 Academy Award nominations, Hugo did not do very well at the box office. Critics attributed this to the extremely competitive market at the time of the film’s release. However, the movie was criticized for being more interested in the birth of cinema than in the fate of the children involved in the story. I disagree and I can back this up by the fact that my two children were gripped by Hugo from start to finish.